Blessed One, Haiku My Heart! and I find my way. More Haiku My Heart at Recuerda Mi Corazon, click here. More A-Virgin-a-Day photos, click here. Posted on December 3, 2010, in Arizona, Haiku My Heart Friday, Mission San Xavier del Bac, my digital photos, my haiku, my senryu, Sonoran Desert, Tucson. Bookmark the permalink. 15 Comments. i love this! perfect, perfect haiku!!! thank you for this jewel of an offering. yes, we are all stumbling pilgrims… thank you for this lovely haiku. Gorgeous ! What a lovely photo and your words are like the sweets prayer. Mary, Mary, how we LOVE thee and I am soOOOOo glad YOU are praying for all of us!!! Holy Cows! You just jogged a dusty memory bank of mine! I had taken photos of that same Virgin and forgot all about that place up there on the hill from the church. That was before digital, so who knows where that print and negative is! Really neat site though. Loved your Haiku (but, of course!). The haiku is just beautiful ,as well as the photo!Love it! 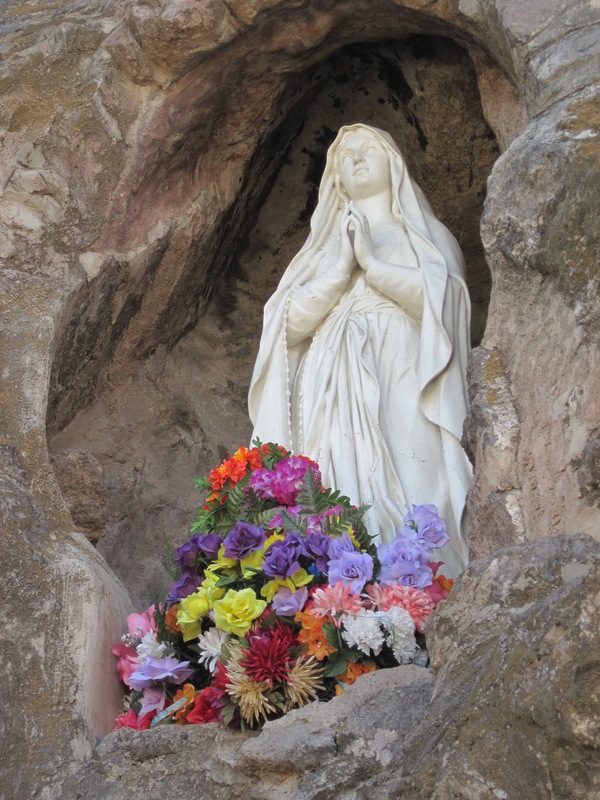 Tucked into her grotto, sweet and colorful offerings at her feet, she blesses all of us stumbling ones with her grace. Blessed by so many poets! Beautiful. Your speak the word in my heart.